Yes! The book that I am co-authoring is available on Amazon! 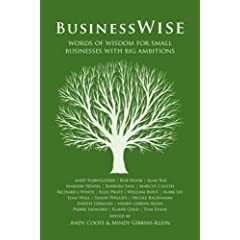 If you are starting a business, or considering doing so, BusinessWise is the book for you. A collaboration amongst over 20 business experts, this book looks at the whole process of setting up a new business with success in mind. It covers a wide range of topics including business set up and vision, marketing (including using the internet), selling, finance, working in and managing teams, working from home and beating procrastination, networking internationally, getting the right message out in the right language, health and fitness and collaboration. The authors, all life members of the network Ecademy.com, are experts in their subject area and have shared many tips and ideas here that they would normally only reveal in training sessions or paid consultancy. The result is a book that provides insights and guidance to new or potential business people as well as existing business owners. Read it with a pencil or highlighter to hand. You’ll need it! The book is in english and you can order it on Amazon. If you want to read my part in the book, flip to page 49: How to attract your target group online. I can assure you, there are really valuable (and fun) pieces to read in there!